Electric gates are one of the most coveted enhancements for modern home and business owners. And why not? They offer the perfect balance between security and convenience. If you’ve been toying with the idea of getting electric gates for your property, get in touch with us now. We are Houston’s most trusted gate and fence service providers, offering all types of repair and installation solutions for electric gates. Sentry repairs all openers. Same day service! Sentry designs, builds, & repairs electric gates & openers. Electric driveway gate openers sales, service, & repair. Electric security gate opener repair, service, & installation. Same day service! WHY SENTRY FOR ELECTRIC GATES & OPENERS? Electric gates are becoming a common sight across residential and commercial properties. Available in a wide variety of price range, electric gates are also easy to maintain and repair. These are some of the reasons for their growing popularity. If you want to improve your home’s value and curb appeal, installing electric gates can be a great option for you. 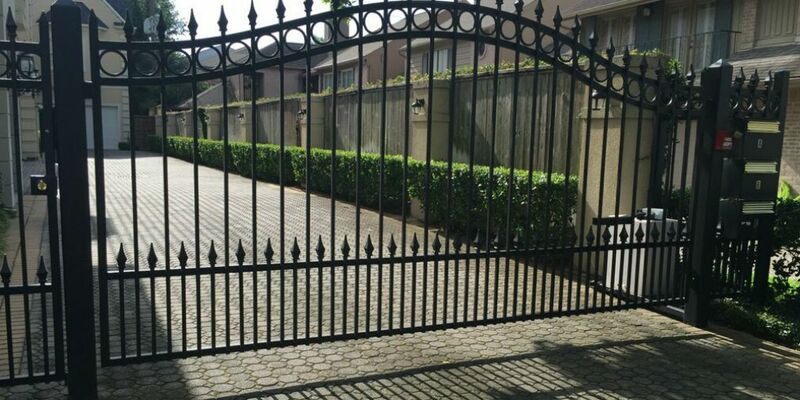 In fact, there are three big benefits that homeowners bank upon while deciding to go for an installation of electric gates on their premises. Improved security and enhanced curb appeal automatically notches up the property value by a degree or two. Every household or business that has a long driveway is a great candidate for electric gate openers. If you are still without one, this may be a good time to consider purchasing a new model for better security of your property. You have three different types of electric gate openers to choose from. There could be plenty of reasons behind why your electric gates decide to simply stop working & needs gate opener repair. The first and most obvious reason of all is that the gate operator does not have the necessary power to run. Please ensure that the electrical breaker installed on the gate has been turned on before you decide to try and operate the gate. The next thing to do after you have established that there is power supply to the opener is to ensure there is no physical interference obstructing the movement of the gate. If that is the case, the motor will require a reset. This is essentially a minor repair and results are often achieved by simply turning the power off and switching it back on. If the situation is something more serious, you could check our FAQ page or better yet call one of our experts. At Sentry Garage Door & Gates, we take care of repairs on all types of entry systems, accessories, and gates. We are committed to providing reliable and fast services to all our customers. You can call us anytime for any type of electric gates related services.